Highlands County was created in 1921 along with Charlotte, Glades, and Hardee, when they were separated from DeSoto County. Highlands was named for the terrain of the county. Highlands County boasts the fifth-oldest population in America in 2012. According to the U.S. Census Bureau, the county has a total area of 1,106 square miles (2,860 km2), of which 1,017 square miles (2,630 km2) is land and 89 square miles (230 km2) (8.1%) is water. In area, it is the 14th largest county in Florida. Highlands county is bounded on the east by the Kissimmee River. Lake Istokpoga, the largest lake in the county is connected to the Kissimmee River by two canals; the Istokpoga canal, and the C41 (outflow) canal. As of 2015, there were 99,491 people and 39,931 households residing in the county. The population density was 97.2 people per square mile. The racial makeup of the county was 85.8% White, 10.4% Black or African American, 0.7% Native American, 1.5% Asian, 0.1% Pacific Islander, and 1.6% from two or more races. 18.2% of the population were Hispanic or Latino of any race. 51.3% of the entire population are female. The median household income was $35,560 with 20.1% of the population being below the poverty level from 2009-2013. The poverty line for Florida was $11,490 in 2013. As of the census of 2000, there were 87,366 people, 37,471 households, and 25,780 families residing in the county. The population density was 85.00 people per square mile (32.82/km²). There were 48,846 housing units at an average density of 47.5 per square mile (18.34/km²). The racial makeup of the county was 83.47% White, 9.33% Black or African American, 0.44% Native American, 1.05% Asian, 0.03% Pacific Islander, 4.14% from other races, and 1.53% from two or more races. 12.07% of the population were Hispanic or Latino of any race. In 2000 there were 37,471 households out of which 20.00% had children under the age of 18 living with them, 57.20% were married couples living together, 8.50% had a female householder with no husband present, and 31.20% were non-families. 26.30% of all households were made up of individuals and 16.70% had someone living alone who was 65 years of age or older. The average household size was 2.30 and the average family size was 2.70. In the county, the population was spread out with 19.20% under the age of 18, 6.30% from 18 to 24, 19.30% from 25 to 44, 22.20% from 45 to 64, and 33.00% who were 65 years of age or older. The median age was 50 years. For every 100 females there were 95.20 males. For every 100 females age 18 and over, there were 92.20 males. The median income for a household in the county was $30,160, and the median income for a family was $35,647. Males had a median income of $26,811 versus $20,725 for females. The per capita income for the county was $17,222. About 10.20% of families and 15.20% of the population were below the poverty line, including 25.60% of those under age 18 and 7.40% of those age 65 or over. Highlands County is part of the Heartland Library Cooperative which has 7 branches that serve Highlands county and some of the surrounding counties, including Glades, DeSoto, Hardee, and Okeechobee. 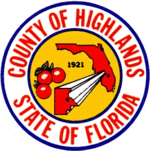 Highlands County, Florida Facts for Kids. Kiddle Encyclopedia.